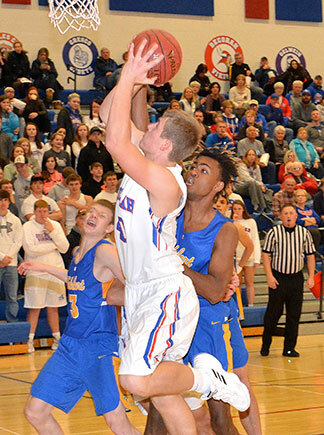 The Decorah boys’ basketball team (0-2, 0-0 NEIC) fell to Dubuque Wahlert at home Tuesday night, losing 74-50. The Vikings struggled to keep up with the Wahlert offense, despite having two players in double figures. “Our guys fought hard but we need to start trusting each other and play together more frequently. Give Wahlert credit as they were a good team,” said Coach Jonathan Carlson. Keaton Solberg and Matthew Franzen led the Vikings with 15 and 10 points, respectively. Pat Bockman and Logan Halverson each added eight. Decorah will hit the courts Friday, Dec. 7, for its first NEIC contest at Waverly-Shell Rock. Tip-off is set for 7:30 p.m. Competing in the third annual Border Battle, the Vikings will be on the court in the Regents Center at Luther College versus Rushford-Peterson at 7:30 p.m. Saturday night. Oelwein will come to Decorah Tuesday, Dec. 11, for a 7:30 p.m. contest.